The Universal Data Analyzer (UDA) provides you with a scalable solution to your control system requirements. Designed to control, record, monitor and communicate data over wireless transmission mediums, this box truly is a universal solution to all of your SCADA applications. With nine available expansion slots, this product can start small and grow as your applications expand adding Digital Input, Analog Inputs or DTMF Module as needed for your application. Network units together using RS485 ports allowing you the ability to handle large facilities. 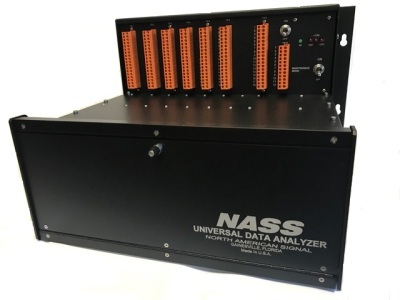 The Universal Data Analyzer (UDA) is a modular system utilized for applications involving supervisory control and data acquisition. The system can be configured for interface to wayside equipment to allow for event recording, real time health monitoring, remote control and diagnostic port interface. The systems can be operated independently at a wayside facility or be configured with a host of remote telemetry packages to allow for centralized reporting. The UDA has an internal Mod Bus with nine available expansion slots that will accommodate Analyzer Modules based on the user's application. Equip the UDA with a 6-watt UHF/VHF DTMF radio transceiver module operating on your licensed frequency provides control from the ground with a standard 2-way portable radio. Equipped with customer configured “voice annunciation features” receive over the air command confirmation on your 2-way radio or base equipment. Integrate a host of telemetry options VHF, UHF 900 MHZ to interface to your communications infrastructure. Emulate numerous supervisory control system interface protocols for high speed or DC line interface. Configure with the Vanguard 1000 package allows the unit to communicate directly to the World Wide Web for transmission of system events using a standard Wireless Web Cellular Interface. Send Emails or text messages directly to multiple user mailboxes with no host processing involved. Initiate FRA Inspection Mode with a single switch capturing and transmitting site records for archive on test and inspection forms. Integrate the UDA into the NAS (NETS) NAS Event Tracking System a WEB Based Centralized Database analysis package to provide automated alarm and dispatch of maintenance personnel. Master - Slave up to 4 units located within 3000 feet of the master unit to provide a distributed monitoring platform at multiple sites. Windows Configurator Program allows the user to easily configure the system to specifically satisfy location requirements. Each of the systems is software configurable by the user for the specified application. RS232 Pass Through: (3) Three for interface to external devices.